EOCENE / OLIGOCENE "LEMURIAN STEPPING-STONES"
Calling attention to a distributional pattern that included (Africa)/Madagascar, the Seychelles, (India)/Sri Lanka and W. Malesia, van Steenis (1962), in his now infamous paper on the land-bridge theory, asserted that "there must have been an isthmian connection between Madagascar and Ceylon over the Seychelles-Comores bank" operating during the middle to upper Cretaceous, which he named "Lemuria". Modern understanding of the geological history of the Indian Ocean refutes both the timing and existence of such a direct land route (Mckenzie & Sclater 1973), but the distributional pattern nevertheless still stands, and for some taxa also includes China, Japan, and E. Malesia. 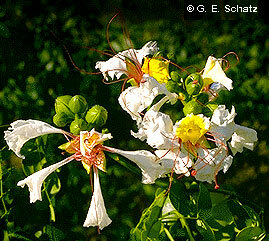 Such a pattern often involves closely-related species in, and around the periphery of, the Indian Ocean and Africa. As India assumed its current position from the early Eocene onward, global sea levels were dropping, with a marked regression at the Rupellian/Chattian boundary during the Oligocene, i.e., ca. 30 MYA (Haq et al. 1988). At that time, significant portions of the Chagos/Laccadive Plateau and the contiguous (at that time) Mascarene Plateau (including the Seychelles Bank, which encompasses over 50,000 km2 now at an average depth of 75 m) could have been emergent, and served as stepping-stones for dispersal of essentially Laurasian (mesic) elements between Laurasia/W. 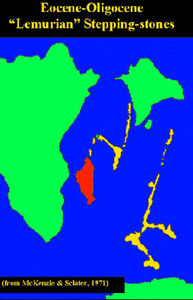 Malesia and Africa/Madagascar via India/Sri Lanka as depicted in Figure 2. Figure 2. Schematic representation of migration pathways active during Eocene/Oligocene after India has attained close proximity to Asia, through to post-collision (and continuing to present), a period during which sea-levels were dropping. Mesic Laurasian and W. Malesian elements enter Madagascar/Africa via India and "Lemurian Stepping-stones" in the W. Indian Ocean (emergent portions of the Chagos/Laccadive Plateau and Mascarene Plateau including the Seychelles). Xeric elements are exchanged between N.E. Africa/Arabian Peninsula and Laurasia/India and may disperse to dry western Madagascar. Thickness of arrow represents probability of dispersal. As such a dispersal track coincides with the "Lemuria" land-bridge of van Steenis, I propose that it be named the "Lemurian Stepping-stones". Xeric affinities between Madagascar and India (e.g., Commiphora (Burseraceae), Delonix (Fabaceae), Moringa (Moringaceae) are best explained by overland migration through N.E. Africa/Arabian Peninsula, and do not provide additional support for the "Lemuria" land-bridge" as Wild (1965) suggested. Although the stepping-stone pathway may only have begun operating during the Eocene, there is no reason to believe that it has not remained active to the present day (Madagascar to Seychelles - 1,000 km; Seychelles to India - 2,600 km), or that migration has not also occurred in an eastward direction (e.g., Brexia (Brexiaceae), Grisollea (Icacinaceae)).